A Chinese businessman purchased a Tibetan mastiff for $1.9 million in 2014. Similarly, in 2011, a red Tibetan mastiff by the name of “Big Splash” sold for a reported $1.5 million. Red Tibetan mastiffs are among the rarest and most expensive dogs in the world. The unconditional love you receive from man’s best friend is priceless. But you’ll likely have to pony up some cash if you want a dog in your life permanently, and if you’re purchasing one from a reputable breeder, that initial fee can be substantial. No matter how much your furry friend costs, though, you probably won’t pay as much as one wealthy Chinese businessman, who coughed up nearly $2 million for a Tibetan mastiff at a “luxury pet” fair in 2014, according to the Qianjiang Evening News. The price likely made the pup the most expensive one ever sold at the time. Tibetan mastiffs are a notoriously pricey breed. 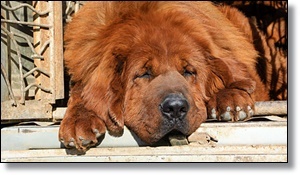 In 2011, one 11-month-old red mastiff by the name of “Big Splash” reportedly sold for 10 million yuan, or $1.5 million. Another one was sold for $600,000 to a Chinese woman in 2009.